Yup, another winning - for a minor prize, that is. 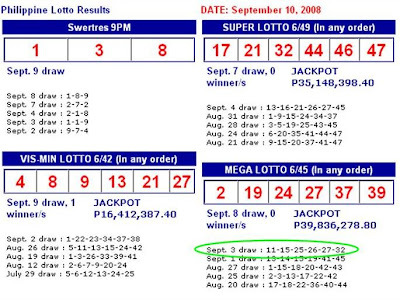 This time for a 10 peso ticket, I won a whopping 40 pesos (the 4th prize, or 3 numbers matching). Ah well, maybe I'm getting warmer or closer to the grand one. Next time. The prize winnings so far is Php 180.00. Awesome.